First, I advise using your vacuum attachment to thoroughly vacuum out the piece. Use the brush attachment to avoid scratching. Be sure to get all the drawers, nooks, and crannies. Gently tip the piece over and vacuum the bottom. Doing this ensures that you get all the dust bunnies and cobwebs that often come with an older furniture item. Vacuuming also removes dust and more easily than a sponge or wash cloth. Once you have vacuumed, check the project piece for any sticky or congealed stains, such as you would find with spilled candle wax (paper towel and warm iron will take it up or you can use a plastic scraper to gently remove it). For sticky blemishes such as you would find with honey or other food spills, use hot water and a dab of dish soap to take them off. A clean, damp cloth can then be used to remove any last traces of dirt or debris. Once your piece is cleaned go on to step two. Check your project piece for any peeling or chipping paint or varnish. Use a plastic scraper, such as you would use for cleaning dishes or get one from your local hardware store, or put it on your Amazon list. Plastic works best for older wood in my opinion because if you slip, it does less damage. Working slowly and carefully, scrape or brush away the loose paint or varnish. Open up some windows and use a paint or varnish stripper to remove the rest of the old paint or stain. Sometimes you will need to apply two coats of the stripper, but most projects are usually good to go with one treatment. Follow the directions on the can, but make sure you put down newspaper first. This way, you won’t strip the finish off of the floor around the piece while you are working on it. Best yet: move the piece outside or into the garage for maximum air ventilation and to protect your floor surfaces. Usually, you will apply the stripper to the furniture with a brush. Apply the stripper evenly, being careful to get a good, thick layer of product on the surfaces. I recommend beginning with a small area, instead of covering the entire piece at one time. This process can take a couple of days or more for a larger item. Allow the solution time to work. Depending on the manufacturer or type of remover, the recommended time will vary. Typically, you can tell it is ready by checking to see if the finish you are removing has become puckered or is crackling. If most of the area is crackled, you are ready to scrape the finish off. Be sure to use the metal scraper and to wear protective gloves while doing this. Repeat a second time if necessary. Be sure to wipe and scrape all of the remover solution from the project piece. Consult the product recommendations on how to remove all residue. Sand the project piece thoroughly. Be sure to go with the grain. If you aren’t sure how to do this, look closely at the image at the top of this article. You will see how the color striations go sideways on some areas of the dresser, but in other areas the variations in color (or striations) go up and down. Use medium sand paper first, then go over it again with fine sandpaper. You can buy many different sanding products and sanders, but you can also just buy the sand paper, fold it into a square and do it the old fashioned way, by hand. Most people use a sanding block, which works well for the open spaces, but for nooks and detail areas you will likely need to use just the paper folded into a small size. Sanding blocks are inexpensive and handy for most projects. 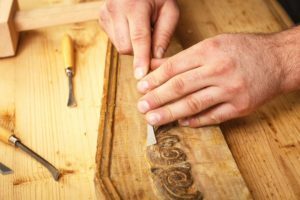 After sanding your project, you will want to clean it a second time, being sure to pick up tiny dust particles with a vacuum followed by what is known as a tack cloth. A tack cloth is a cloth that is mildly sticky, and works well at picking up all those almost invisible grains of wood or grit. Now you are ready to apply your new finish. Select a finish (paint or stain), that is a semi-gloss, gloss, or even a lacquer for best results. Applying a flat, or satin finish results in a finish that is not easy to clean and absorbs stains. The higher gloss finishes allow for easier care and cleaning later on. Use a high quality paint brush rated for stain and varnish. Even if you are going to paint the piece, a high quality brush will create a smother finish. If you are applying stain, after painting the stain on the piece, (or area of the piece if it is large) take a clean dry cloth, such as a plain cotton towel, and rub off the excess finish. The longer the stain sets, the darker and deeper the finish will be. 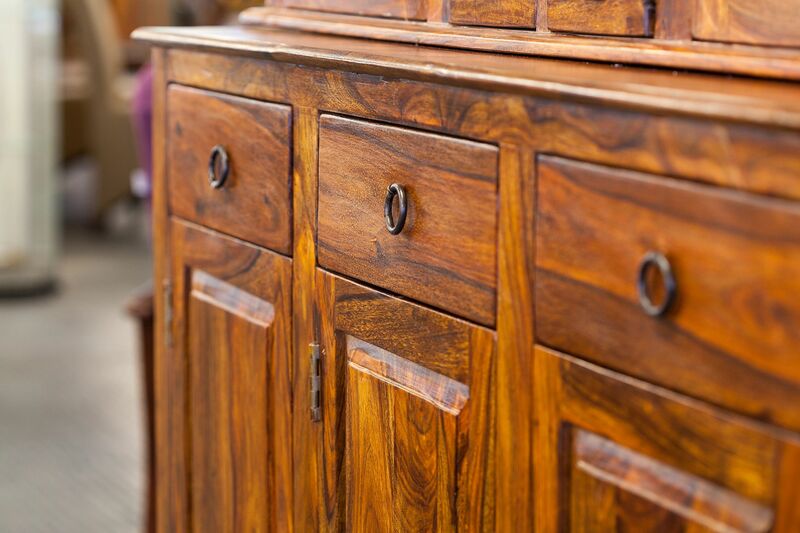 If you are using a very dark finish, letting it sit too long can sort of erase the natural wood grain. If that is the look you want, great. But if you still want to see the natural grain in the wood, don’t let it sit too long. You can always apply more later to deep it up. Typically, you will want to allow your new piece to dry for a minimum of two days. Before you use the piece, or set out your decorations, be sure to check for any sticky spots by running your dry hand over the finish. If it feels sticky anywhere, let it keep drying for another couple of days before using. The reason I recommend this is because there have been times when I thought paint was dry, and put knick-knacks or a vase, and later found they were stuck to the paint. Once your piece is thoroughly dry, enjoy the fruits of your labor. Thank you for reading this article, and if you have any questions, let me know in the comments section below. If the piece is in really good condition, do I have to sand before I paint it? Hi Becky! Thanks for posting a note. You asked a really good question. The answer depends on a number of factors. Since you have sent in some photos, I have a pretty good picture of how you want it to look and what you will be using it for. You are right that the old secretary’s desk is in almost mint condition. When I enlarge the photos, I can see a few rough spots on the edges. You can probably get away with just using a piece of fine sandpaper and going over the edges to make sure there are no little splinters sticking up. That said, you still have to find a way to make the finish stick to it. Your finish is some sort of semi-gloss stain. In order to paint it the light retro green color you sent me, you will need to primer the surface of the desk with a primer made to stick to all surfaces, if you sand it you can use a regular primer. You can buy all surface primer in either spray cans, or brush-on styles.